Maybe it was our tasty Thai feast in Kelantan over the holidays. Or perhaps it's the energy I've been directing this past week to planning an upcoming fly-drive-EAT holiday in northern Thailand. Whatever the reason, I've got Thai food on the brain. And whenever my thoughts turn to the deliciousness that lies north of Malaysia's border it's invariably kanom jeen that first comes to mind. I remained kanom jeen clueless for over a month after we moved to Bangkok four years ago. I look back on those thirty-plus days with regret, because this room temperature dish of soft, thin noodles made from fermented rice, topped with a variety of curries and eaten with any number of fresh, blanched, and/or pickled vegetables, is the perfect refreshing antidote to a sweltering Bangkok day. 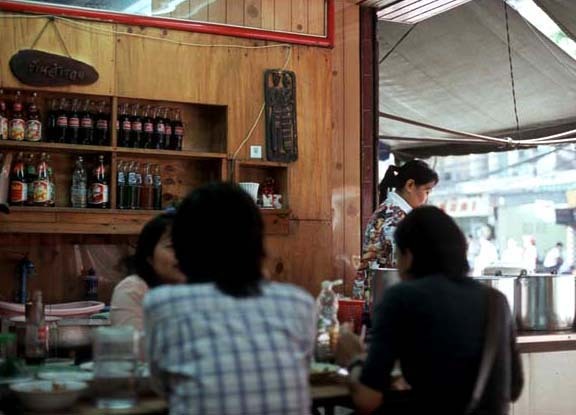 As even the most casual visitor to Bangkok knows, you can't walk down a street or stroll a soi without passing or tripping over an open-air shop or a mobile cart peddling Thailand's better-known noodle dishes (guaytiaows pad tai, kee mao, and lad naa and those belonging to the served-with-soup species). Not so kanom jeen. Because it's a breakfast-lunch noodle, it rarely makes an appearance at night markets. While its curry toppers usually occupy enormous, can't-miss-'em stainless steel pots, noodles are often kept tucked out of sight, so a kanom jeen hotspot can easily be mistaken for just another rice-and-curry hut. And it's an old-fashioned dish that - sadly - like other somewhat obscure Thai street snacks, is suffering from attrition. My former Thai tutor has been purchasing her favorite version from the same old woman for over thirty-five years. The vendor does a rip-roaring business, but with no children willing to take on the demanding work of operating a street stall with nary a holiday, one more corner of Bangkok will be kanom jeen-less once she retires. 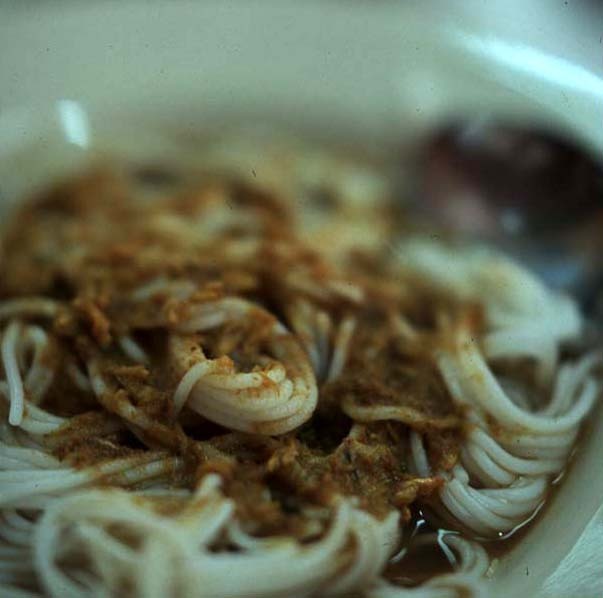 If, the next time you're in Bangkok, sampling this noodle delight sits high on your to-do list, you might try to get yourself invited to a merit-making ceremony - wedding, funeral, or thambun baan (house blessing); kanom jeen is traditionally served to guests and the monks who perform blessings. Or, you could make your way to either of two spots we try to hit when we're lucky enough to be on a chow spree in the Thai capital. 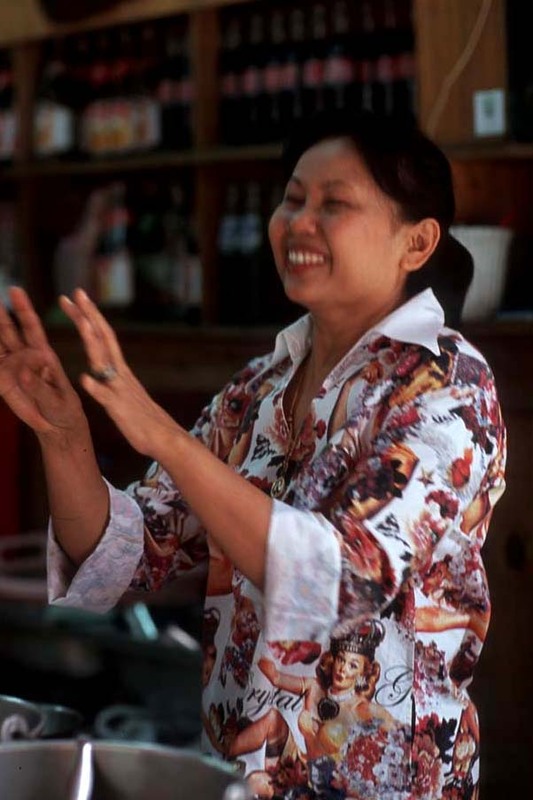 Here, in a simple open-air storefront on noisy Soi Suanplu (off Sathorn Road), a moon-faced woman with a generous smile has been serving up kanom jeen for about eight years. To go with her kanom jeen, which she buys first thing in the morning at nearby Suanplu market, she offers a choice of four homemade curries: nam ya bpaa plaa ("jungle" thin curry with fish, coconut-milk free and fiery hot), nam ya plaa (a milder but still zippy thin curry, made with coconut milk and ground, rather than chunked, fish - see top photo), gaeng kiaow wan gai (mild and lightly sweet coconut-green chili curry with chicken), and gaeng tai plaa (southern-style fish innard curry). There's nothing fishier than what floats about in a fish belly; some might find the flavor of the fish innard curry a challenge. But those willing to press the edge of the envelope of stink will be rewarded with a robustly complex, fiercely spicy stew in which the strong aroma of fish organs somehow doesn't ride roughshod over that of other ingredients like kaffir lime leaves, lemongrass, galangal, palm sugar, and tamarind. 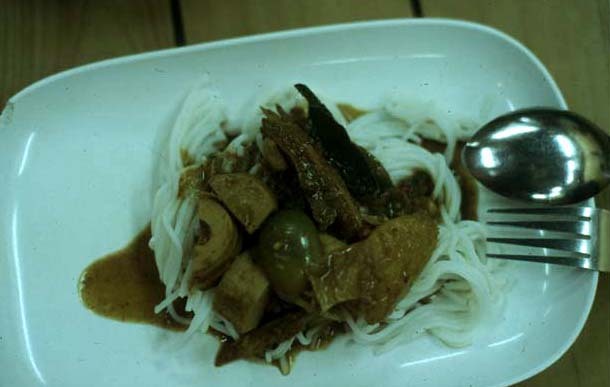 In addition to boneless pieces of ocean fish (whatever the shop's proprietress finds freshest at the market; on this day, mackerel), the olive green curry boasts chunks of fresh bamboo shoot and pleasantly bitter golf ball-sized eggplant quarters, soft at the seeded center but resistant to the bite closer to the skin. Kanom jeen's accompaniments make it the ultimate have-it-your-way noodle. Types and number will vary according to shop or vendor, from the most basic (long beans, cabbage, sprouts, and Thai basil leaves) to the more elaborate (a shop in Phuket, rumored to be ground zero for southern-style kanom jeen, is said to offer 21 different accompaniments). 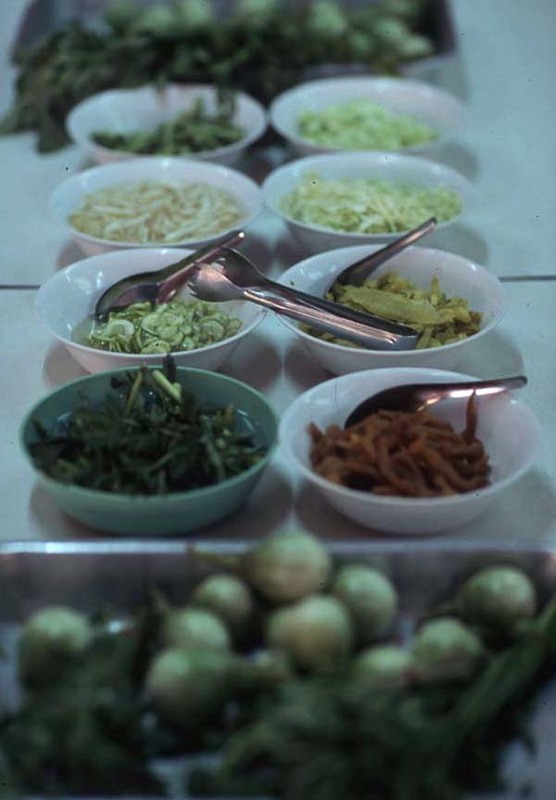 Here, on each of two long communal tables, this shopkeeper sets out bowls of (clockwise from bottom left) blanched water spinach, sliced cucumber lightly pickled in sugar and vinegar, bean sprouts kept crispy in water, fresh long bean nubs, chunks of cucumber, shredded fresh cabbage, sour and salty pickled cabbage, and salty-pungent preserved cabbage. Stainless steel pans hold fresh eggplants, Thai basil, garlicky cha-om, and Chinese celery leaves. Also on the table are jars of roasted dried chilies (both ground and whole) and white pepper and bottles of fish sauce and white vinegar. Accompaniments are included in the price of a plate of kanom jeen, and it's understood that diners will help themselves to as much as they wish; there's absolutely no shame in adding seconds, thirds, or even fourths to as one works one's way through a plate of noodles and curry. While kanom jeen is the reason to visit this shop, tawtman plaa (fried fish cakes) are a delectable bonus. Best fresh out of the oil (between 11am and noon), these supremely tender fish patties are about as far from the oily, rubbery blobs served in Thai restaurants overseas (and in Thailand too, I'm afraid) as homemade Italian sausage is from a 7-Eleven hotdog. Deep-fried basil leaves and spicy sweet-sour cucumber relish add fresh and fragrant notes. Kanom jeen shop, 433/6 Soi Suanplu (on the left side of the street as you approach from Sathorn Road, across from a gold shop and just before Suanplu Market). 8am to about 7pm. Expect to pay 20-25 baht per plate of kanom jeen and curry. Fried fish cakes are about 20 baht per serving. I'm generally not a fan of tarted-up street food served in up-market surroundings. Too often creature comforts like air-con, noise reduction, and shelter from exhaust fumes are accompanied by vittles that lack the sparkling flavor of the single dish prepared over and over, day after day, by the one cook. 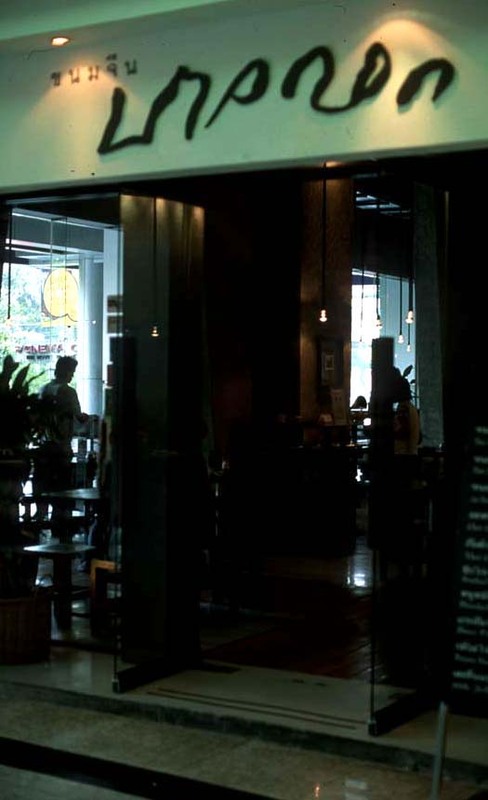 An exception to the rule (my rule) is Kanom Chine, eatery by day but bar by night, swathed in industrial chic and occupying a relatively quiet corner of Bangkok's MBK shopping mall. The restaurant's kanom jeen curries, though they might lack a certain kind of rough-edged "mom made it" element, are consistently yummy (the menu's other noodle dishes, however, are sub-par and best avoided). Six types of kanom jeen are on offer here. 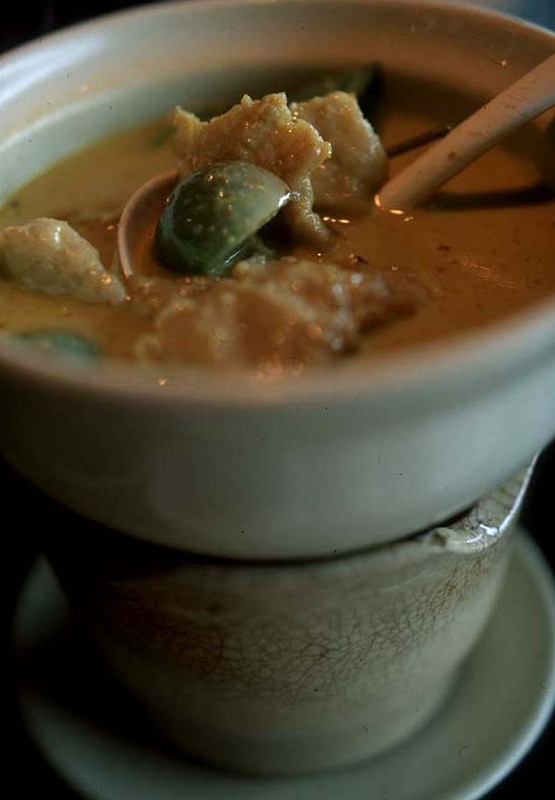 I favor the gaeng kiaow wan luk chin plaa (green curry with fish balls), a smooth green curry rich with coconut milk. Toothsome quartered eggplant share the serving bowl with irregularly shaped masses of sweet, fragrant ground fish that are more soft, pillowy patty than rubbery ball. If I had one suggestion for Kanom Chine it would be that they offer the option of extra fish patties added to an order. Noodles are served traditional style, coiled into neat, tight rounds; they loosen up and become manageable when anointed with a bit of curry. Right after an order is placed is the ideal time to make for Kanom Chine's discreetly placed, glass-shelved "accompaniment station" (we're not talking tacky salad bar with sneezeguard here), with its admirably large selection of vegetables (bean sprouts both fresh and blanched, blanched sliced bitter melon and long beans, shredded fresh cabbage, pickled cabbage) and herbs (cha-om, basil, cilantro). Glossy whole roasted red chilies are divinely smoky. Here, as at more homely kanom jeen shops, diners are free to load on the veggies to their hearts' desire. Servings of kanom jeen are small enough to leave room for non-noodle side dishes that make no concessions to non-Thai tastes; be prepared to leave smelling like garlic, and think twice before asking for anything "phet phet" (very spicy). 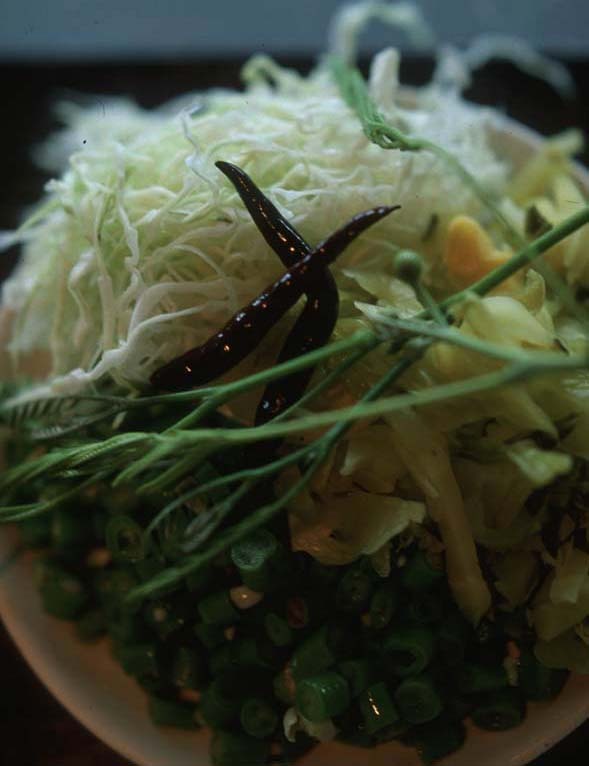 Somtam (green papaya salad) and somtam carrot are wonderfully sour and will leave lips burning (note that unless requested otherwise, the latter arrives adorned with chunks of pungent salty egg). 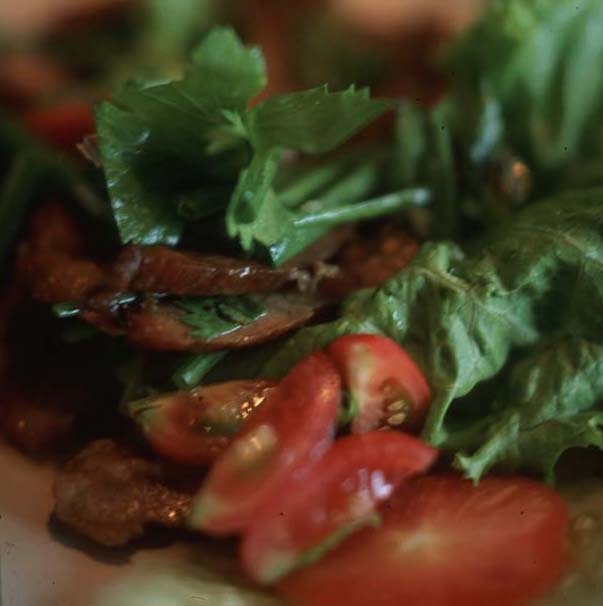 Yam muu yang (grilled pork salad) is nothing short of heavenly: a dressing of lime, sugar, chiles, fish sauce, and big chunks of pounded raw garlic engaged in a head-on duel with thick slices of expertly charred porkiness. 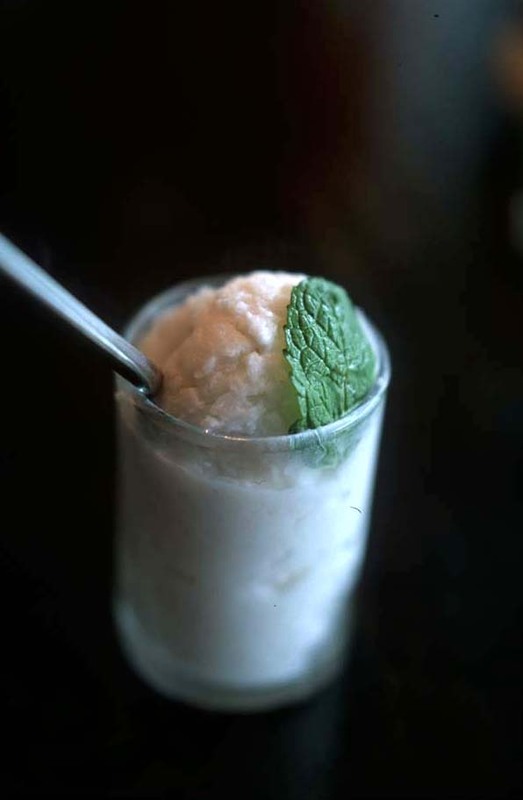 And I'd never end a meal here without a glass of icy, intensely flavored coconut sorbet, another snack of the street that Kanom Chine pulls off without a hitch. Kanom Chine, 1st floor MBK shopping center (National Stadium stop on the LRT), near the Princess Hotel. 10am-5pm for food (turns into a bar after 5p). Kanom jeen are around 50 baht per plate; pork salad is 59 baht. Gosh, am I ever so glad to find out that it's not frowned upon when I liberally help myself to the accompaniments! Love the stuff though I've only ever had it in food courts in shopping centres. Yum! I haven't had that dish in ages. I think I'll be making myself some soon. Hi cupcake. Well, knowing Thais, no one would tell you if you were being a greedy pig anyway (that can be both good and bad). Orchid, ditto! I luv luv luv Thai food! Onigiri, what kind of curry do you make to go with your k.j.? This article is right on the money. I lived in Thailand for ten years in my youth. 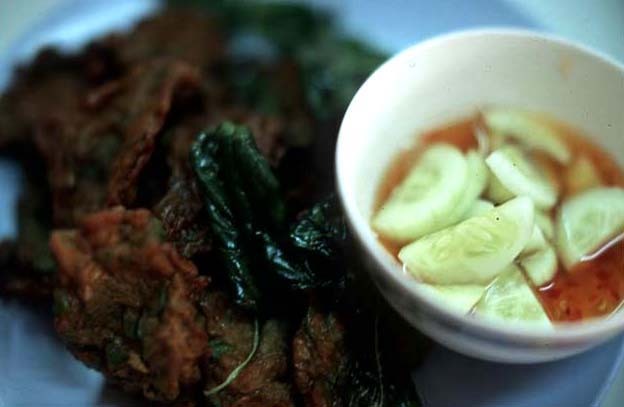 We used to drive down to Hua Hin and on the stop off at the roadside stalls to eat. My favorite was knom jeen with the plain sweet peanut-based sauce. It must be Chinese in origin, since "knom Jeen" means "Chinese candy". Hey I remember this dish from Thailand - only had it once and it was one of my favourites the whole trip! I would love to make it myself and have found a recipe but what actually is "kanom jeen"? Can you buy it outside of Thailand (I'm in New Zealand). Any help would be heaps appreciated! I've found that Japanese somen noodles are a good substitute. They should be cool, not warm, when the curry is ladled over. Just cook and drain them -- they will stick together which is fine. Or you can form them into coils while they are still wet, as in the posts above. 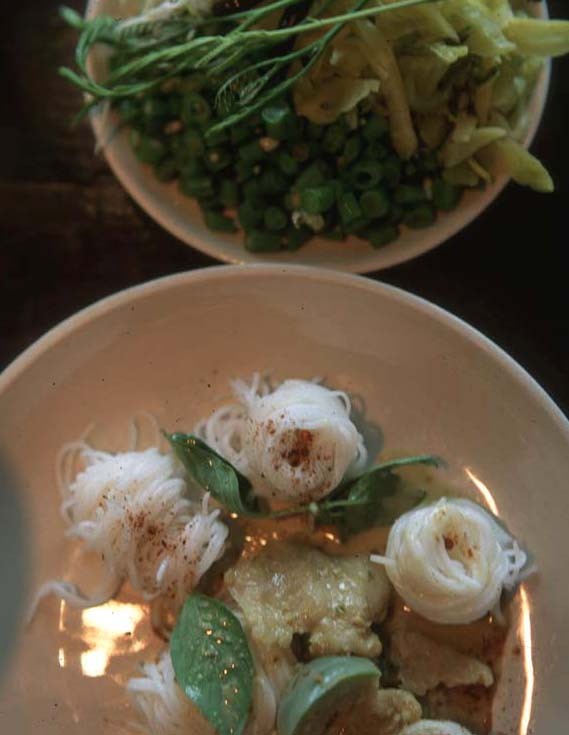 David Thompson ("Thai Food") has a great recipe for KJ nam mgiaw.